Thousands of homes experience hail damage every year. Those cool ice stones are not that cool if they become a threat to your property. To be able to make a claim, it is important to identify hail damage as it occurs. Have your roof checked immediately by Interstate Roofing professionals after the storm. Hail damage may not look like a severe problem, but actually is anything but harmless. It leads to leaky roofs and, once the water is allowed in, you can expect all sorts of messy and costly problems. So, how do you identify hail damage on your shingles? It is not a difficult process and homeowners can even do it themselves. 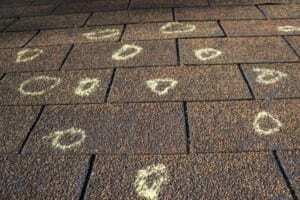 Damaged roofing materials must be marked with chalk and photographed. Look at metal elements (vents, gutters, downspouts etc. ), as they are likely to show damage better. Examine the ridge and look for shingles with displaced granules and for granules in the gutters. Also look for less visible signs of damage, such as dents in the shingles, and keep an eye out for cracked or split shingles. For making a claim, you also need the expertise of a professional, to state whether the damage is just cosmetic or it represents a functional problem.